Rep. Tom Cotton, R-Ark., retained his title as the fastest male in the 113th Congress, running the 3-mile course of the 33rd Annual ACLI Capital Challenge in 18:29. Cotton&apos;s pace was fast enough to score the Cotton Tail Rabbits second place among House teams — Rep. Earl Blumenauer&apos;s team Red White & Blumenauer took the top prize, with the Oregon Democrat clocking 29:51 — but not as quick as his previous record. Cotton ran the Anacostia Park course in an impressive 17:55 in 2013 , sparking rumors among the Capitol Hill running community that he was rumored to be on pace to potentially break a longstanding race record. Former Rep. Bart Gordon, D-Tenn., holds the record for the House. He finished in 16:59 in 1995. Unfortunately for Cotton, his other big race — the heated Arkansas Senate campaign against Democratic Sen. Mark Pryor — has taken a toll on the congressman&apos;s workout regime. "I do have to work harder to get my runs in each morning ... " Cotton told HOH. "Arkansas is a big state and I&apos;m traveling all over the state, so I&apos;ve got a lot of early, 4:00, 4:30 wake-up-and-go calls, so I don&apos;t always get my runs in the way that I have in the past." Despite his slower finish, Cotton said it "was a great race, a lot of fun, and for a very good cause obviously." 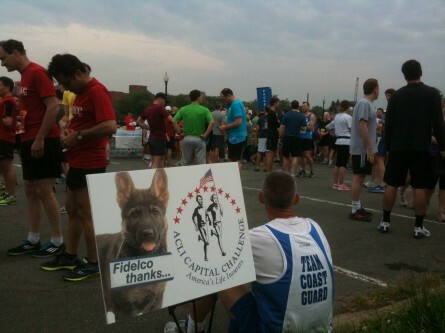 Proceeds from the event went to the Fidelco Guide Dog Foundation, which helps provide guide dogs to wounded veterans. The congressman took up running as part of his training to join the Army in 2005, and discovered he really enjoyed the sport. Cotton has since run 11 marathons, and takes regular morning jaunts around the monuments when he is in D.C., or western Arkansas&apos; Mount Nebo, when he is back home in Dardanelle, Ark. If Cotton beats Pryor in November and runs the race as a senator in 2015, he has a better chance of breaking a Capital Challenge record. The Senate record currently belongs to former Sen. Max Baucus, D-Mont., who ran the inaugural 1981 Capital Challenge in 18:15. If he wants to beat Baucus someday, "I&apos;ll have to start training," the congressman joked Wednesday evening. Other competitive House teams in the annual race include the Quaker State Quicksteppers, the third place team anchored by Rep. Matt Cartwright, D-Pa., and The Home Team, which took fourth with Rep. Chris Gibson, R-N.Y., bringing up the rear. In the Senate, Rob Portman, R-Ohio, and Charles E. Grassley, R-Iowa, rallied the top two teams. Third place went to the Ragin&apos; Hagans, with Sen. Kay Hagan, D-N.C., finishing in 35:13, the best pace for Senate females.